When I was a little girl, I wanted to be a ballerina. There were no ballet lessons in my life, and I'd been gifted with a roly-poly physique - alas, I was more of a prancing Pudding than a Pavlova. Nevertheless, wearing bubble swimmers and a frilly half-petticoat, I danced my heart out to a scratched old recording of Tchaikovsky's Nutcracker Suite. So it was with great delight and anticipation that I opened the beautiful picture book, Dance of the Sugar Plum Fairy, and set the accompanying CD to play. I wasn't disappointed. 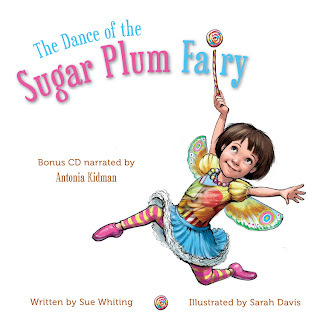 Written by Sue Whiting, illustrated by Sarah Davis, and published by New Frontier (2009), this is the perfect package for any child who loves to dance. It is part of the Music Box series, created to introduce children to classical music. It's also a great story. It tells the tale of candymakers, Marcus and Mary. The greedy King tastes their sugarplums and keeps demanding more and more. A Sugar Plum Fairy helps them meet the King's demands. But then he gets a Royal Bellyache and Marcus and Mary are ordered to find a remedy. Luckily, the fairy again comes to the rescue, and the candymakers make her a wonderful thank you gift, fit for a dancing fairy. Sue Whiting has accomplished the delicate balancing act of remaining true to the original Nutcracker fairytale, without sacrificing the elements that make a great modern picture book. I loved the touches of humour, the use of onomatopoeia, the repetition that cries out for children to join in. At one stage, after the King has demanded more sweets, Marcus cries, "'Impossible! We will be strung upside down in the market square, so pigeons can poop on us.'" Kids will hang on every word when this book is read aloud! I also liked the message implicit in Mary's philosophy : "'We can only do our best. And that's what we will do.'" Sarah Davis's illustrations just pop off the page, full of character and fun, yet subtly underscoring the fairy tale setting. There are lots of lovely details for children to marvel over, like a King who sleeps with his teddy, the candymakers' baby in various cute poses, and of course the fairy herself - an enchanting combination of sparkly magical creature and real little girl, with lollies in her tummy and wearing striped leg warmers. The story is beautifully narrated by Antonia Kidman, and enhanced by excerpts from Tchaikovsky's music. Listening to the audiobook on CD, while following along in the print book, is a useful step for children on the pathway to independent reading. I also love audiobooks for travelling - a fun and educational idea to remember for long car or plane journeys. What an excellent introduction to classical music this package would make - for libraries, for classrooms, and for families. You could follow it up with listening to more music by Tchaikovsky - the stirring Trepak is available on Youtube, as is Dance of the Sugar Plum Fairy played on Glass Armonica, or you can share the Kirov ballet performance with your kids. If you're into acapella like me, check out this great techno Dance of the Sugar Plum Fairy - I love to see people who enjoy their music!